The SAD-BJP Government recently constructed some Sikh memorials across the state but little attention seems to have been paid to Guru Gobind Singh Marg, which was inaugurated in 1973 with much fanfare by the then Chief Minister, Giani Zail Singh. 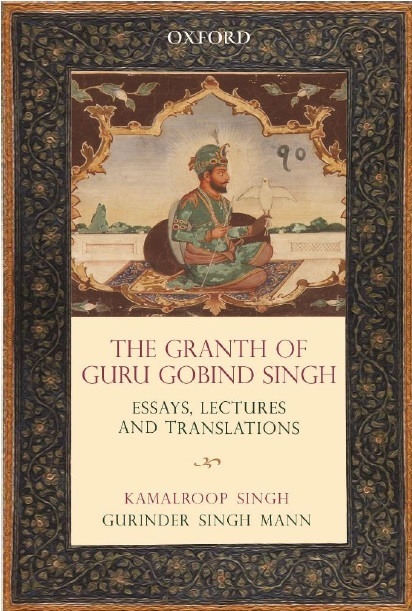 It is believed that the 10th Sikh Guru had taken this route from Anandpur Sahib to Talwandi Sabo. This 570-km highway connects about 91 shrines with which the Guru's name is associated. 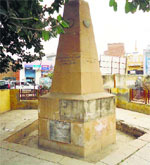 A Dashmesh Pillar with missing tiles on Guru Gobind Singh Marg in Muktsar. Despite having such religious importance, the road named after Guru Gobind Singh is in a state of neglect. Most of the milestones on the road have been uprooted by anti-social elements and not been reinstalled. The condition of Dashmesh Pillars, too, is not up to the mark. A case in point is a pillar in the Red Cross complex here. Most of the tiles of this pillar, which has sacred verses inscribed on it, are missing. Moreover, no signboard has been put up to show the way to this pillar. Locals said the pillar was not cleaned and its boundary walls were not whitewashed since a long time. They appealed to Chief Minister Parkash Singh Badal, who is scheduled to visit Muktsar town on Tuesday, to visit all Sikh memorials and gates in the town to see their sorry state of affairs himself. Members of the National Consumer Awareness Group said about 81-km of this historic marg passes through Muktsar district and a large number of people had encroached on it. "Some liquor vends, too, have been opened on this historic marg. They demanded that these be immediately shifted to other locations. Some locals alleged that the state government was playing politics over these memorials. "The Dashmesh Pillar was set up by former Congress Chief Minister Giani Zail Singh and Mukte Minar near the District Administrative Complex was set up by another former Congress Chief Minister Capt Amarinder Singh. May be that is the reason why these memorials are not being maintained properly," said Gurinderjit Singh, a local resident.